Something I see pretty frequently is catchers attempting to cheat during a throw to 2B on an attempted steal. There are a number of problems with this. One, it isn't faster. You aren't actually accomplishing anything. Rolling forward and gaining ground to 2B does nothing but delay the time it takes you to get the ball into the air, where it is traveling at it's fastest rate of speed towards your target. If you can't gain 5 MPH for every tenth of a second that you spend gaining ground, you just lost time. After thousands of controlled environment measurements and live in-game measurements, I can assure you that no catcher at any level can gain enough velocity to offset the loss in release time by moving forward during their throw to 2B. It's just not possible. 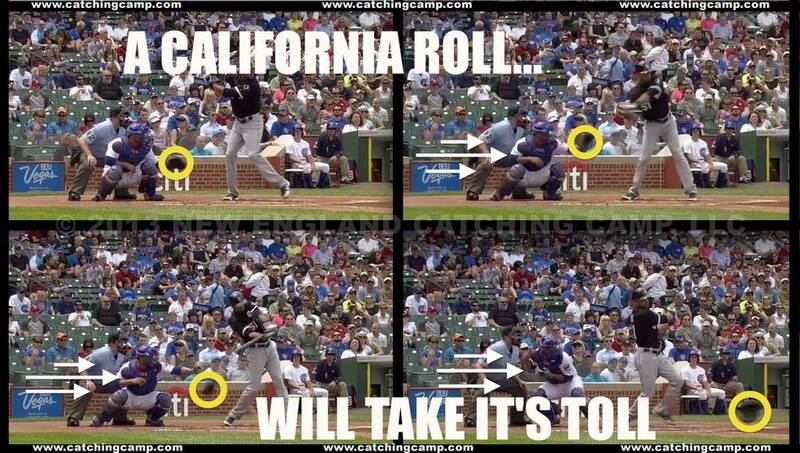 Two, by "California Rolling" into the throw, we risk putting our glove hand in the bat's path if the batter swings. This not only puts us in harm's way, but we risk giving both the batter and the runner a free base. Stay back, let the ball get to you and then let proper exchange, footwork and throwing mechanics take over.